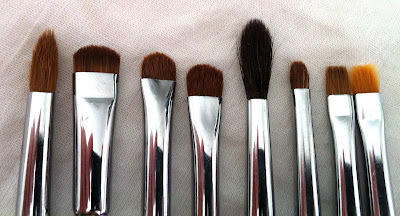 The last in this series of my posts on eye makeup brushes is on "detailer" brushes. This, in effect, is a "catch-all" for all the remaining brushes that don't fall into the other categories discussed so far (lay-down brushes, socket brushes, blending brushes, pencil brushes), and generally tend to be smaller brushes for small or tiny areas or detail work. 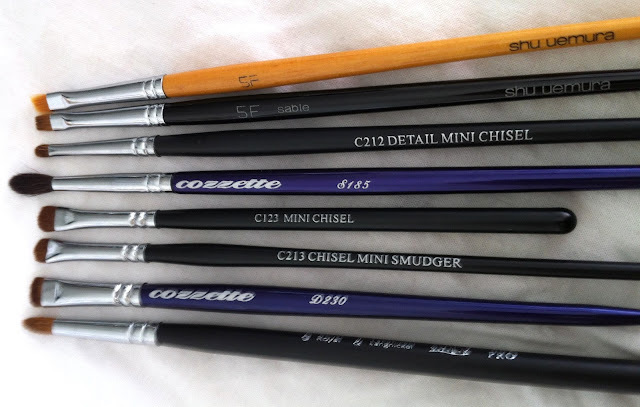 Some of the "detailer" brushes I use. When I refer to "detail" work here, I don't mean detailed liner work (see here for a post on liner brushes, and here for a post on how to create the dreaded eyeliner flick!). I am specifically talking about smaller areas or for particularly small eyes which will themselves require much smaller brushes. The one example probably everyone knows about is the tear duct area - a small area that requires a small brush if you want to add a highlight. Or maybe for the tiny area in between a double-wing where you want to add some glitter or glue or a darker or brighter shade to this small area in between the two wings. Or if you want to create a really tiny barely imperceptible smudge underneath your eye, or for "barely" smudging-out a very sharp cut-crease, or for any detailed work in the eye area, bearing in mind that this area is small, so any detailed work will necessitate a small brush. Teeny tiny brush heads for detailer work. Two of the other Crown brushes from above; the Crown C213 (Chisel Mini Smudger) and C123 (Mini Chisel) are also not bad (and also inexpensive) detailer brushes, with the former being slightly more pointed and flat, and the latter being slightly more dense; I tend to use these for laydown on tiny lids or for a smudged-out but thin application of shadow underneath the lower lashline. Continuing from above, the Cozzette S185 is fantastic for socketing a tiny eye, and the D230 is a super-dense, super-firm, super-unyielding brush that can create very precise (but soft) lines in an act (but it's not a brush I use very often). The problems with tiny brushes is that, if they are truly tiny, they may not be sufficiently dense to lay down product, which will necessitate multiple applications, which you want to avoid if you're dealing with a small area, as you run the risk of being less precise than you want. So what do you look for in a tiny brush? 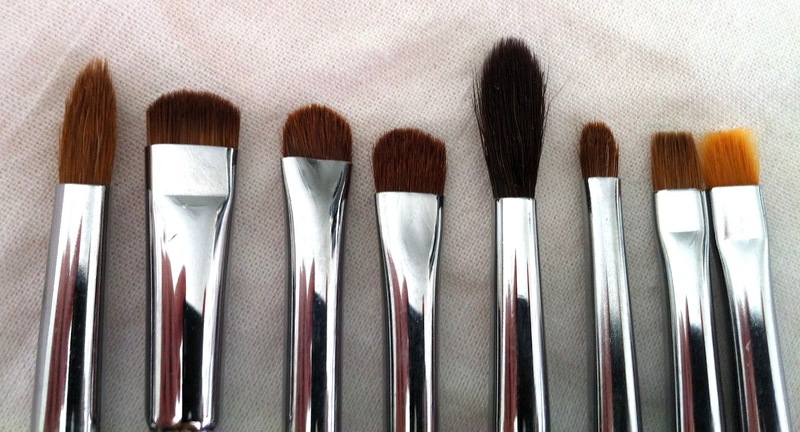 Remember the function: if it's detailed crease work, you'll need a more pointed brush. If it's detailed flat work, then you need a flat brush. Either way you want a good quality, good shape, reasonably dense brush, which just happens to be small. Any small brush can be used for detail work - you don't need to go out and purchase specific ones. In fact if you have a bunch of different shaped eyeliner brushes, these may suffice, and I also of course use eyeliner brushes for detailed eye work, not just for liner (the fantastic MAC 211 is a case in point: it's flat at the ferrule and tapers to a fine point, it can be used flat-on or on its side to deliver different results). But really, any standard or fine point eyeliner brush. Or a lip brush. Or a pointed concealer brush. Or an angled liner brush. Detailer brushes are not brushes you may need very often, and if you don't plan on elaborate or detailed makeup, then you can safely skip.